Maintenance on refrigeration needs to be at the forefront of every good Catering and Hospitality business. Well consider your car for a moment. It could be worth about the same as your combined refrigeration equipment. It gets used for approximately 2 hours a day and is serviced on schedule every few months. We look after our cars because they are an investment. Your commercial refrigeration equipment is the hardest working piece of equipment in your business. When you lock up and go home, your fridge plant keeps running 24 hours a day, 7 days a week. Its no wonder they tend to break down at the worst inconvenient time you can imagine. Runs 24 hours a day – 7 days a week. Can ice up if left unmaintained costing hundreds of dollars in lost stock. In the case of ice, which is considered a food, it needs to be fit for human consumption hence ice machines require cleaning and sanitization. And yet we commonly see that in the majority of cases, a refrigeration breakdown could have been prevented with a good maintenance regime. This image above shows the back side of an evaporator in a cool room. We took this photo half way through cleaning it. Seriously, if this was in your fridge at home it wouldn’t be good enough. 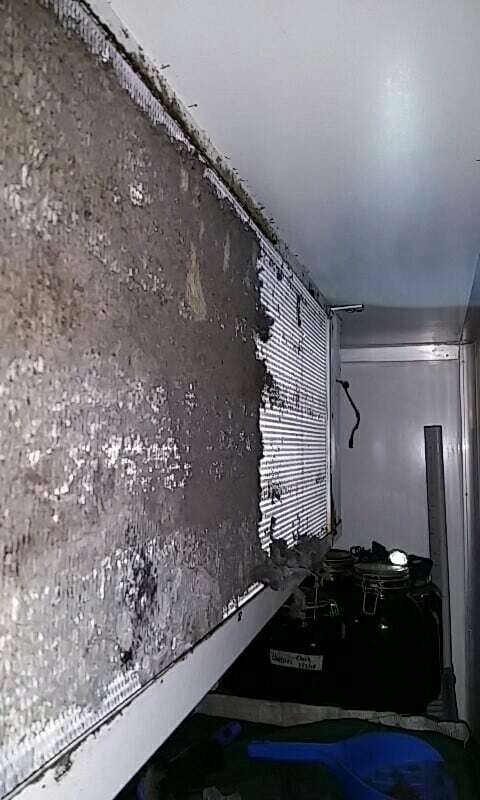 We are constantly amazed that business owners risk health issues to this level by ignoring maintenance. This condensing unit located on the client’s roof needed an urgent compressor change. I think it is fair to say that judging by the amount of pigeon faeces that this expensive failure could have been prevented with an occasional maintenance! Hats off to my tradesman who persevered with the disgusting job in order to get it back on line so fast. Of course, once up and going the system was rinsed down. 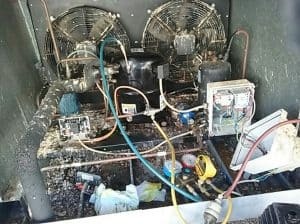 The underlying message is that when your refrigeration equipment is located out of sight you have no idea what condition it is in. Therefore, maintenance is so important if you want to have reliable commercial fridge plant. When servicing an Ice Machine, it is important to realise that at the completion of our works, that all ice will be fit for human consumption. Whilst some commercial catering clients over look this health consideration, I often ask; – “Would you leave water in a glass for 2 months and then give it to someone to drink?” Obviously, the answer is a resounding “NO”, so the next question I have is why then, do people leave ice machines without any attention until they breakdown? You wouldn’t believe the gunk we find in the ice bins sometimes! The capital outlay of purchasing a new ice machine far outweighs the cost of maintaining one. 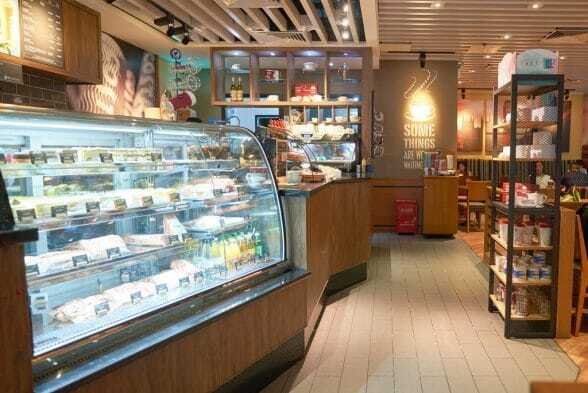 Whilst we accept that the cost of maintenance is not attractive to many clients, the benefit of having ice readily available for commercial catering equipment users is seen as paramount to running a good food and beverage service. No one wants to run down to the service station for more ice at 10pm during peak hour at the bar! Call us for you commercial refrigeration repairs today!